The perfect photos to fit into my Oriental mania. See here a previous post, will all explanation included. 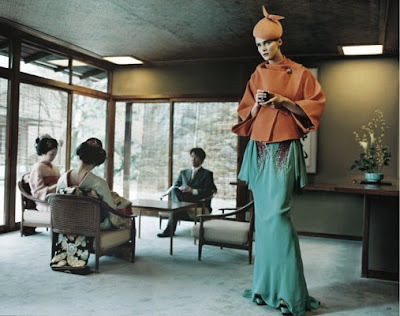 The photos above are from Vogue Nippon October 2008. Styling done by Anastasia Barbieri. 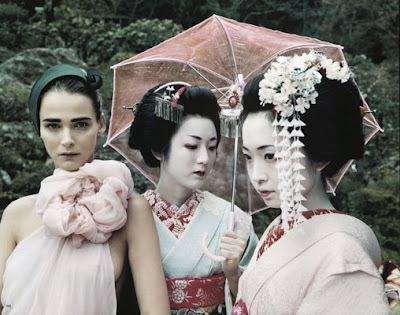 You may recognise Carmen Kass as one of the models, but I have no idea who the Japanese girls are. If anyone knows, please share! I'm fascinated with the atmosphere it was created, the idea or the story behind... It's quite a rare thing when the idea is not just brutally thrown in the face of the viewers. As it happens with obviuosly-themed photos like sports (including olympics and the likes; not that I don't like the sport theme, and I definitely won't deny that it is quite amazing, it's just that it's... plain obvious). Sweet Daiane, you've been tagged (see my blog for details).